When the rate of production of iodine equals the rate of removal of iodine, equilibrium exists. This equilibrium also known as “xenon 135 reservoir”, since all of this iodine must undergo a decay to xenon. In equilibrium, the iodine concentration remains constant and is designated NI(eq). The following equation for the iodine equilibrium concentration can be determined from the preceding equation by setting the dNI/dt =0. 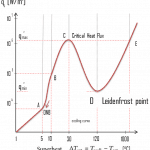 Since the equilibrium iodine concentration is proportional to the fission reaction rate, it is also proportional to reactor power level. 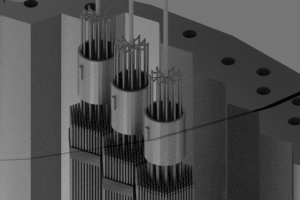 When the rate of production of xenon 135 equals the rate of removal, equilibrium exists also for xenon. The xenon concentration remains constant and is designated NXe(eq). The following equation (1) for the xenon equilibrium concentration can be determined from the preceding equation by setting the dNXe/dt =0. For xenon 135 to be in equilibrium, iodine 135 must also be in equilibrium. 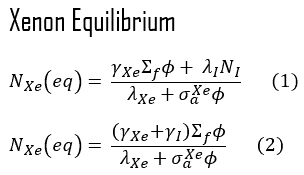 Substituting the expression for equilibrium iodine 135 concentration into the equation for equilibrium xenon (1) results in the following (2). From this equation it can be seen that the equilibrium value for xenon 135 increases as power increases, because the numerator is proportional to the fission reaction rate. 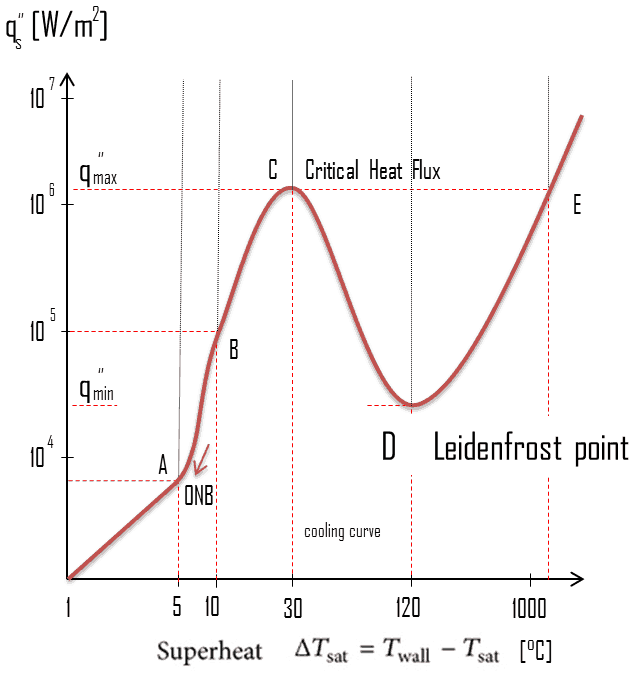 But the thermal flux is also in the denominator. 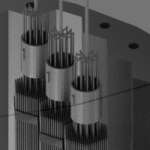 Therefore, as the thermal flux exceeds some value, the xenon burnup begins to dominate, and at approximately 1015 neutrons.cm-2.s-1, the xenon-135 concentration approaches a limiting value. 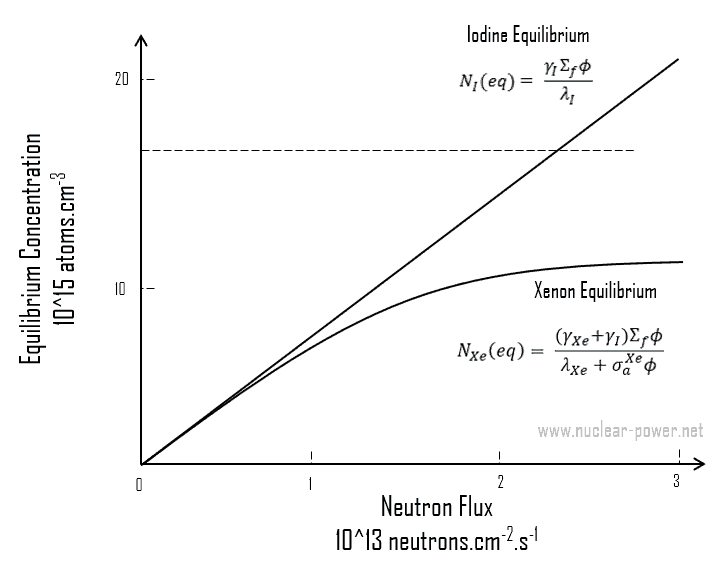 The equilibrium iodine 135 and xenon 135 concentrations as a function of neutron flux are illustrated in the following figure. 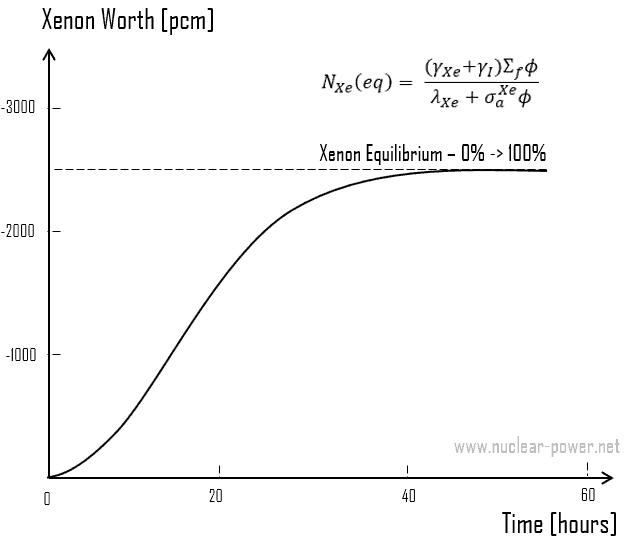 Following reactor startup both iodine and xenon concentrations build from zero to equilibrium values over a period of several half-lives (e.g. seven half-lives). Since the half-lives are in hours, after a few days (in about 40 to 50 hours.) equilibrium is achieved. This is known as the stationary xenon poisoning. 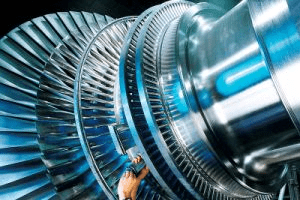 In pressurized water reactors, this stationary xenon poisoning reaches up to 2500 pcm and the excess reactivity must be able to compensate equilibrium xenon, when the reactor is operated at nominal power. Stationary xenon poisoning usually does not vary with cycle burnup, but differs significantly with the reactor power level. Xenon 135 worth after reactor startup. 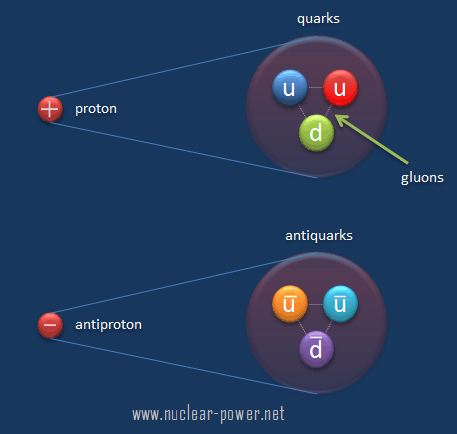 As was shown, the equilibrium iodine 135 and xenon 135 concentrations are a function of neutron flux.The higher the neutron flux the higher the equilibrium xenon 135 concentration, but equilibrium xenon-135 is not directly proportional to neutron flux level (due to an increase in burnup rate). 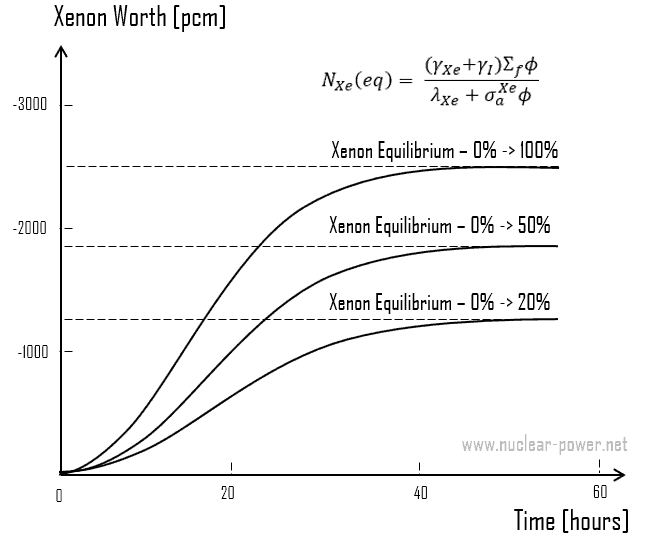 For example, equilibrium xenon 135 at 20% power is about half the value for equilibrium xenon 135 at 100% power for many reactors. 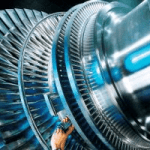 Because the xenon 135 concentration directly affects the reactivity level in the reactor core, the negative reactivity due to the xenon concentrations, known as the xenon worth, for different power levels or conditions are frequently plotted instead of the xenon concentration.